The Doogee BL7000 is unlike any mid-range phone you’ve seen, even those with large batteries, for two reasons. One is its attempt at a luxury phone look and, especially, feel. The other is its $160 price tag that almost makes you want to forget all its imperfections. It may not deliver on all its amazing-sounding specs, but the Doogee BL7000’s killer battery life makes it worthwhile. Doogee BL7000 is a smartphone that can withstand the demands of very demanding users. His battery at 7060 mAh is capable of holding a tube with the display on for a whole working day. All in all, the Doogee BL7000 is an affordable phone with a great battery and good security features. I like it a lot. The phone is not perfect though: there’s no NFC, there’s no 802.11ac, no USB Type-C, no notification lights, no oleophobic coating and you will need to use the proprietary charger in order to get fast charge. 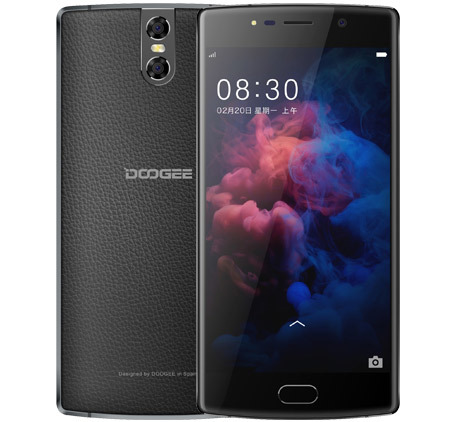 If you can live with the brand’s name and proudly say, I own a Doogee, then the BL7000 has a lot to offer especially if you want a device that can last more than 24 hours under very heavy load. Positive: High autonomy; great built quality; good price. Positive: High autonomy; metal case; great built quality; good hardware; quick charging. 0.22 kg: Dieses Gewicht ist typisch für Smartphones. 76.86%: Weltbewegend ist diese Bewertung nicht. Obwohl es bei den meisten Websites einem "Befriedigend" entspricht, muss man bedenken, dass es kaum Notebooks gibt, die unter 60% erhalten. Verbalbewertungen in diesem Bereich klingen oft nicht schlecht, sind aber oft verklausulierte Euphemismen. Dieses Notebook wird von den Testern eigentlich als unterdurchschnittlich angesehen, eine Kaufempfehlung kann man nur mit viel Wohlwollen darin sehen.